[April 13, 2007] Angela M. Gill, 27, of Lincoln died Wednesday, April 11, 2007, in an auto accident in the 1800th block of Illinois Route 121 in East Lincoln Township. Pronouncement of death was at 7:55 p.m.
Visitation will be from 2 to 4 p.m. Monday at Fricke-Calvert-Schrader Funeral Home in Lincoln. Her funeral will follow at 4 p.m., with the Rev. Jame Hahs officiating. Burial will be at a later date. Mrs. Gill was a registered medical assistant with mentally disabled, working through residential developers. She was born April 21, 1979, in Springfield to Bryan Worth and Vicki Nichols. She married Louie Gill Sr. on Oct. 27, 2001, in Lincoln. She is survived by her father, Bryan Worth of Decatur; her mother and stepfather, Vicki and Eric Poertner of Lincoln, a significant other, David Oltmanns of Lincoln; one son, Kenten Oltmanns of Lincoln; two stepchildren, Joshua Gill and Louie Gill Jr., both of Lincoln; three brothers, Shaun Worth, Jessie Worth and Andrew Johnson, all of Lincoln; a half brother, Robert Lowe Jr., serving in Iraq; a stepsister, Dianna Bland of Lincoln; her maternal grandmother, Mary Ann Hopp of Lincoln; an aunt, Valerie Hardy of Lincoln; and best friends, Cynthia Fletcher of Cornland, Shelly Barger of Lincoln, Casey Barger of Lincoln and Christi Poe of Lincoln. She was preceded in death by her paternal grandparents and maternal grandfather. Memorials may be made to the First United Methodist Church of Lincoln or March of Dimes. 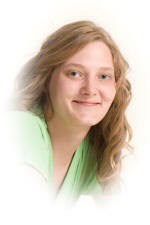 Click here to send a note of condolence to the Gill family. ...You can send a condolence note to families via e-mail? 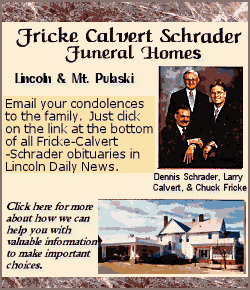 Fricke-Calvert-Schrader, Peasley and Bennett funeral homes have this option available. Click on the name of the appropriate funeral home (in the line above) and insert the family name to send a note.